We all know that San Jose is going to be a major beneficiary of Super Bowl 50 in less than three months. 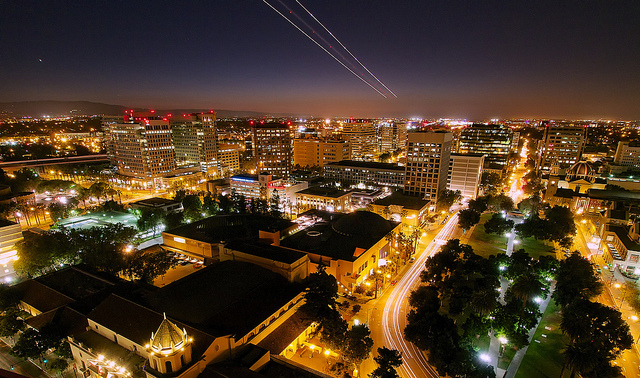 Every hotel room that week has been booked and several events have been planned from San Jose ranging from "Super Bowl Opening Night" at the SAP Center, an expanded Downtown Ice season, a new Guadalupe River Run, and a Super Bowl-themed South First Friday. The SB50 committee is still coming up with ideas for getting Downtown in the Super Bowl spirit. In his sports blog, Mark Purdy posted a new idea from the last SB50 briefing--lighting San Jose in gold during Super Bowl weekend. Personally, I think this is a great idea. Residential, commercial, and office buildings would be encouraged to use gold illumination during Super Bowl week. This would create a unified theme across the Downtown core. I actually think we should take it a step further. With modern LED lighting, it is easy and relatively inexpensive to plaster any color up on a building. So why not bathe the city in teal during Sharks playoffs or blue for the Earthquakes. The city could turn red for Valentine's Day or Green for St. Patrick's day. It is a low cost way to add some more character and brand identity to the streets of Downtown.